We are a boutique book design studio offering detail-oriented, customized solutions with heart. You’ve poured countless hours into your book, and now it deserves the highest level of attention and care. “DTP” stands for Desktop Publishing . . . but we also like to think it means “Design to Publish.” Technology has evolved quite a bit since the days of manual typesetting (with actual metal blocks!). The digital era has certainly made typesetting and publishing much easier and less expensive, and yet, this ease has also made it easier to make mistakes . . . to pay less attention. At DTPerfect, we add the attention and craftsmanship back into the digital era of publishing. Books, no matter how they are made, are objects of high cultural value. They are your story and legacy—your contribution to humanity. We believe that every book should be a masterpiece crafted with high attention to detail, and we offer our services so that you can relax and write! A true perfectionist will say, “It’s never perfect.” There will always be a missing comma hiding away after rounds and rounds of revisions. So, what then, do we mean by “Perfect”? To us, perfection starts with listening. We listen to your project goals and customize a solution that is a perfect fit for you. Perfection happens when we can connect with trust, honesty, gratitude, and giving. This heart-to-heart alignment allows us to co-create your next project with a high level of attention and pure creativity. Our main focus is on design and consulting. Rather than publishing your books for you, we educate and empower you to publish professionally on your own. But we also can’t let you have all the fun! We love books so much that we publish a small selection of books, notebooks, and planners. 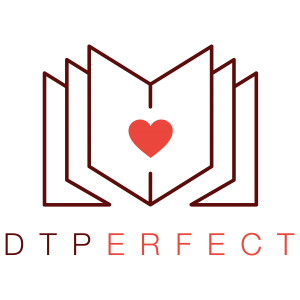 Hi, I’m Elena, Creative Director at DTPerfect. I work with a team of talented designers and book lovers. A book may be a single object, but it’s always the result of great minds working together. I love collaborating with authors to create books that inspire, teach, and leave a legacy. As an author myself, I understand the challenges and excitement of the publishing journey. I strive to provide as much help as possible based on my personal experience and continuous education in industry standards and best practices.